BMT Graduation begins on a Thursday! Exciting things happen on the last Thursday of BMT. Trainees are called Airman for the first time and this day marks the end of Air Force Basic Training. It is also an exciting day for families. On this day, families will finally get to see their Airman After 7.5 long weeks. The day begins early for both families and Airman. Family members may attend one briefing but are not required to do so. Orientation Briefings are held in the auditorium at the Reception Center, Bldg. 6330 at 7am, 9am and 1pm. Families are encouraged to scream and cheer on the Airman as they run by, chanting "Jodies". Families are also encouraged to bring any banners and wear squadron t-shirts. Squardron t-shirts, buttons with your airman's photo, mini-guidons and more can be purchased prior to graduation from Basic Training Store. The flights will cross the retreat pad twice so families will have two opportunities to take pictures or video. Basic Video Productions will be on-site taking photos and filming all flights from an elevated platform with the best possible view of the airmen's run. These photos can be purchased on a flash drive along with all other event photos from Thursday and Friday's ceremonies. This flash drive can be purchased inside room 106 on Thursday from 7am-12pm and Friday from 7am-12pm. Room 106, Basic Video Productions' office, is also where you can pick up your airmen's portraits if they have not done so already during photo pickup in their 6 WOT. There is also a Graduation Events DVD for sale which will include all of the video footage filmed by Basic Video Productions from Thursday's and Friday's events. This DVD can be purchased inside the lobby of the reception center near the front entrance on Thursday from 6am-12pm and Friday from 7am-12pm. Watch this video snippet to get an Idea of the Airman's Run experience. 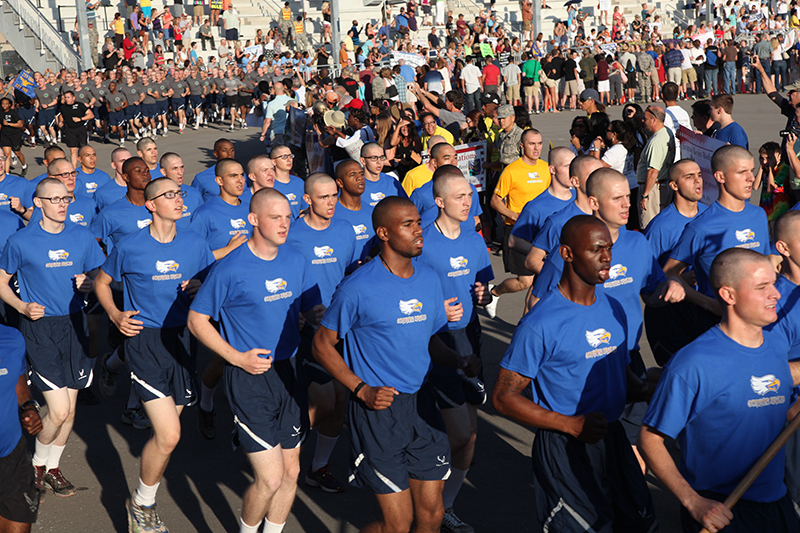 After the Airman's Run, flights return to their dorms and change into their ABUs for the Coin Ceremony. During this time, families can visit many of the vendor exhibits inside the reception center. Many of the vendors offer discounts for events or meals in San Antonio for families and BMT graduates. Be sure to pick up a map from the front desk of the Reception Center. The map shows where the flights will be placed on the retreat pad. Basic Video Productions will be available to record personalized messages on the Retreat Pad immediately following the airmans run until 9am. All of these messages along with all of the event footage filmed on Thursday and Friday will be included in the Graduation DVD. This DVD can be purchased inside the lobby of the reception center near the front entrance on Thursday from 6am-12pm and Friday from 7am-12pm. Families are expected to take their seats by 10:00 am. At 10:45am, the honor graduates will march on to the Retreat Pad and the Top Honor Grad will be recognized. After Honor Grads are dismissed they will rejoin their flights and march down the retreat pad with them for the coin ceremony. 11:00am flights begin marching on to the Retreat Pad in order to Receive their Airman's Coin. The ceremony signifies the end of Basic Training. 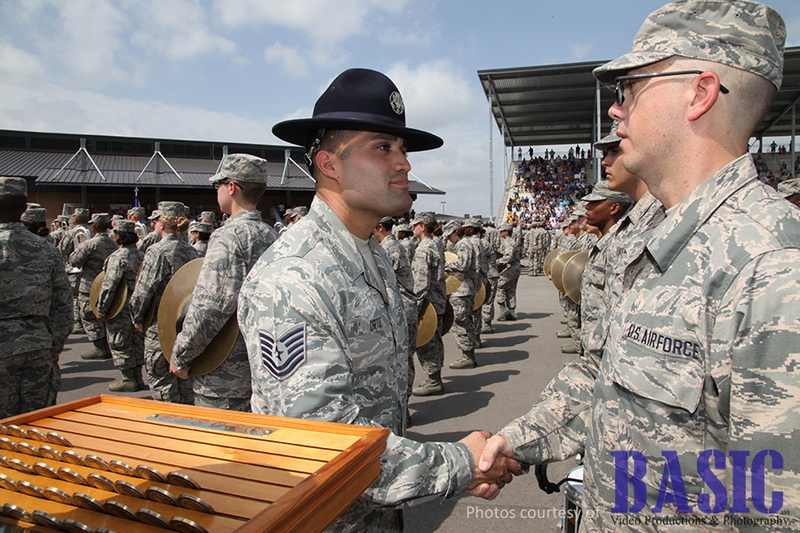 The Coin Ceremony marks the official transition from trainee to Airman. The Retreat portion immediately follows the Coin Ceremony. During Retreat, the U. S. Flag is payed tribute, brought down, folded and safeguarded. After Retreat, Airmen will sing the Air Force Song and be dismissed for Base Liberty. 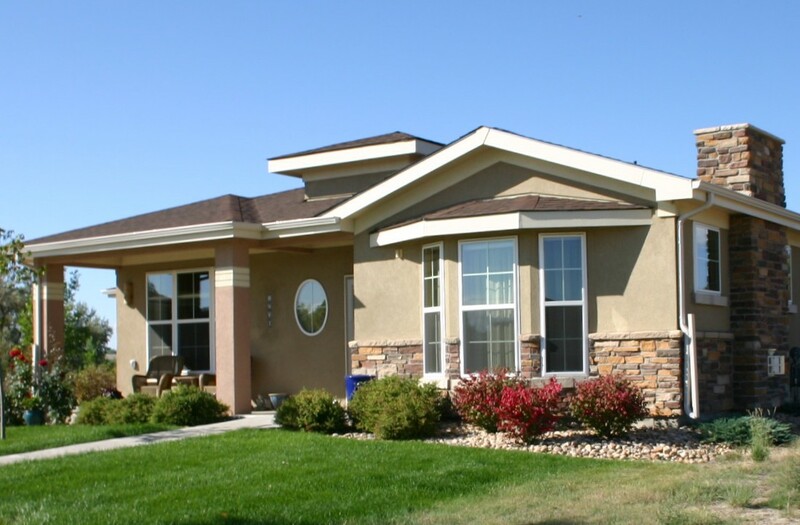 At this time, families can move on to the Retreat Pad to greet and congratulate their Airman. The tradition is that Airman must be "tapped out" in order to be released to their visitors. To Tap Out your Airman, simply tap him or her on the shoulder. Photographers and Videographers from Basic Video Productions will be walking around filming and taking photos during the tap out. Photographers are also available for family portraits until 12:30pm in room 106 of the Reception Center, there you can choose to either have your photos printed or include them for free with your purchase of a flash drive of the event photos. A buffet is also made available to families at the Gateway Club from noon - 7:30pm. Airman get a reduced price for the buffet. Families pay full price. Download a list of places to visit on base. Airmen have must be back in the dorms by 8:00pm.